You’ve seen it on FoxNews. You’ve heard Bill Donohue, president of the Catholic League, harangue about it. You’ve gotten dozens of emails calling for its boycott. But what’s all the fuss about The Golden Compass? What should I look for if I read the trilogy or see the movie? How will I talk about it around the water cooler at work? What should I say to my classmates about it? Movies as controversial and decidedly anti-Christian as the His Dark Materials Trilogy, naturally create a buzz which draw out our views as to how we as Christians relate to the world. Before I go further let me make the obligatory Phoenix Dirk Dark Steele Movie Disclaimer. I have not seen this movie nor read the books. I am not recommending the movie or the books. The movie, to be released on Dec 7, is rated PG-13, and it is my understanding that there are sexual themes in the books, at least; Phillip Pullman is an avowed atheist, and he makes no bones about his disdain for organized religion and a belief in God. Just because I’m writing about the movie, does not mean I think anyone should see it. Rather, I assume some will see it and more of you will be drawn into conversation about it especially in your relational circles where you’re the Christian-viewpoint Person. That all being said, here’s what you should know. 1. It is richly imaginative. Philip Pullman has created a marvelously rich secondary world. In review after review, I have heard how well Pullman has created a universe which is familiar and yet cleverly different. Pullman is a master story teller, who plies his craft excellently. 2. Pullman is honest about his convictions. 18th Century poet, William Blake said of John Milton (who wrote Paradise Lost) that “he is of the devil’s party without knowing it.” Blake meant that Milton’s portrayal of Satan in Paradise Lost was so clever and intriguing, that you sympathized with Satan rather than viewing him as the lying villain. Pullman, however, is of the devil’s party, and he does know it. 3. 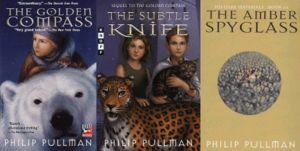 Pullman’s His Dark Materials Trilogy (of which The Golden Compass is the first of three) is a retelling of Milton’s epic poem, Paradise Lost. In fact “his dark materials” is a phrase from Milton’s Paradise Lost. Pullman is retelling the creation story in which he asserts that there was no creation but rather a realization. An angelic being tells Lyra, the main character, the following about The Authority (that is God), “The Authority, God, the Creator, the Lord, Yahweh, El, Adonai, the King, the Father, the Almighty — those were all names he gave himself. He was never the creator. He was an angel like ourselves — the first angel, true, the most powerful, but he was formed of Dust as we are, and Dust is only a name for what happens when matter begins to understand itself. . . . The first angels condensed out of Dust, and the Authority was the first of all. He told those who came after him that he had created them, but it was a lie.” This assertion is exactly Satan’s argument for rebellion in Paradise Lost, Book V. The rationalization goes like this: “I don’t remember that God made me, but rather I have always been as I am now; consequently, if God did not make me, then I owe him nothing.” Obviously, this is an attempted strike against the assertion of the sovereignty of God over his creation and creatures. 4. Pullman’s plot conflicts, character motives, and ethical dilemmas are oversimplified. Pullman has created a simplistic, dualistic, binary, melodramatic, Manichean universe. [long pause, blink, blink] All this is to say, this world is a Star Wars universe: people dressed in white and others dressed in black. Barely without exception are all church leaders and authorities murderously corrupt while the rebellious, individualistic, and marginalized are unquestionably good. This sort of oversimplification could only exist in an imaginary universe. For example, I heard recently, that Adolf Hitler was a decidedly militant non-smoker who offered gold watches to those of his friends who would promise to quit smoking. Adolf Hitler, zealous for the physical health of his friends, only in the real world could that be true. 5. His imaginary world is dishonest. Because of Pullman’s insistence to live in this oversimplified universe, he falls into the denial of how complex reality really is. Pullman loves revolutionaries, but apparently he hasn’t heard how the great revolutions since the American Revolution bred the likes of Robespierre, Stalin, and Mao Tse Tung – all brutal repressionists who were responsible for the murder of thousands and millions of innocent, marginalized, peoples. Pullman’s inability to be honest is most clearly epitomized in his main character, Lyra who not only lies but is consciously aware of how good she is at lying. Almost all the good she accomplishes is through deceit, and only in the third book does she get caught lying. Rather than concluding that lying doesn’t pay, Lyra (and the reader) most likely deduce that lying doesn’t always pay – in fact sometimes you’re better in telling the truth. This tip of the hat to truth-telling, though, is more pragmatic – that is because it works – rather than a moral absolute good. 6. The story becomes ironically, irrelevant. Because of Pullman’s over-simplification of reality, the trilogy’s ending is anti-climactic. It is true, that Lyra takes on the task of giving The Authority “the gift of death.” 19th Century German philosopher, Frederick Nietzsche cried, “God is dead, and we have killed him.” In His Dark Materials, Pullman is basically saying let’s put this dinosaur (God, theism, religion, Christianity, the church) out of its misery. The problem is why do the revolutionaries think they are right? Ultimately, one Authority succumbs to another authority, but in reality, nothing is different, the new authority becomes the Authority, and the cycle starts anew. 7. And finally, who gets to say that there is no Authority? This of course is the self-contradictory assertion which only creatures make. Only a greater authority can say who’s in power and who’s out of power. If Pullman is the one who says there’s no greater authority, he himself must be the greater authority. If dogmatic, oppressive, controlling, authority is to be rebelled against, well, we should rebel against Pullman’s attempts to will his reality over ours. Assertions like Pullman’s always undo themselves. If in reality, there is no authority, then we shouldn’t be quibbling about who’s in charge; by virtue of the fact that we are arguing about who’s in charge provides proof that something or someone is – Someone Over All. We can think of it this way: I was never made (that is created by another) then I should be able to remember making myself. If I can’t remember making myself and if I was never made, then I must not exist. Problematically, non-existent things don’t sit around contemplating their non-existence, therefore they must have been made. If they’ve been made and don’t remember doing it themselves, then Someone else must have done it. Wow, I need to take a nap; that hurt. When movies or books like the His Dark Materials Trilogy come out, we shouldn’t be so surprised at how vehemently anti-God people can be. At heart, everyone born (except Jesus Christ), said, “Not your will be done, but my will be done.” It is the good news that God came to those who were his enemies, “God-haters” as the Apostle Paul called us. Don’t be afraid to lean into the controversy surrounding the movie. We can move towards God’s enemies because we too were once his enemies but Jesus has made us his children. For a more thorough and engaging review of the trilogy, see “The Devil’s Party” by Alan Jacobs in The Weekly Standard, 10/23/2000, Volume 06, Issue 06. The complet article is now posted on the First Things website.